Last winter, I found the Boxing Conditioning Club (shameless plug). As of this fall, I am one of four co-captains. Participating in a club sport has given me a new perspective on athletics at Dartmouth. However, I cannot claim to understand the immense time commitment, effort and passion that varsity athletes undertake. How many students play a sport at Dartmouth? Of the roughly 4,410 undergraduate students on Dartmouth’s campus, for the 2016-17 academic year nearly half play a club or varsity sport. How many club and varsity sports does Dartmouth have compared to other schools? Brian Austin discussed the average number of varsity sports teams at Dartmouth, 35, compared to other schools. “It’s not even close to average if you look across the country … but it is fairly representative of the Ivy League,” Austin said. Where does funding come from and how is it distributed? The 2018-19 Dartmouth Club Sports Manual breaks down the $155,125 that makes up all club sports’ budget. Nearly 70 percent of that total is allocated towards travel costs. 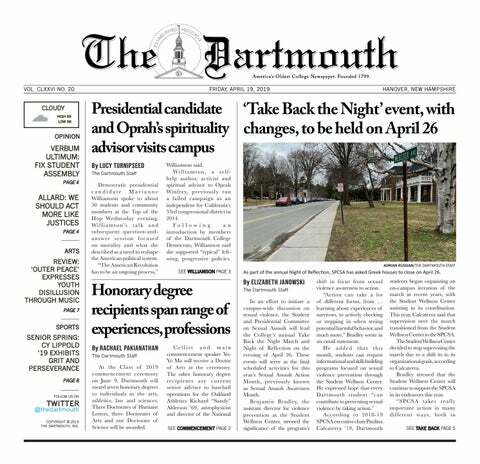 Remaining funds are split between the 33 clubs on Dartmouth’s campus. Depending on sport, clubs are allocated a set amount — $200 for single-gender and $300 for co-ed clubs with seperate scoring for men and women — at the beginning of each academic year. Travel costs are also dependent on what sport is played. Rugby is nationally recognized and therefore has a larger budget than boxing which does not travel at all. Varsity sports had$29,000,000 in expenses, according to the U. S. Department of Education. “There are three main sources: money from the College, endowments and gifts … we generate more than half the money we need to run our department,” Austin said. Gifts can be both team-specific and for the general department. Budget is allocated depending on team size, equipment needs and coaching. Unlike club sports, there is no set amount, and like endowments, budget can change year to year. Equipment used by club sports is primarily purchased by the individual club. However, there are exceptions. “Clubs work their budgets to meet their operating expenses … in some cases we can help. Sometimes those purchases are necessary … and [they] can be very expensive,” Sommers said. Conversely, varsity sports provide almost all equipment for athletes. What is the time commitment for varsity and club sports? Varsity sports have a time commitment nearly five times greater than club sports. “NCAA rules say no more than 20 hours a week, in season. Riding on the bus to away games don’t count,” Austin said. This commitment to their sport does not preclude athletes from the academic obligations of any other student. “There is no such thing as an excused absence … it is really up to the student to work out an accommodation with the professor,” Austin said. “Whether dealing with paperwork, budget management, scheduling with other teams … conflict management … it’s amazing what these students can do,” Sommers said. Sheehy expanded on the idea of club sports as a personal growth experience rather than just a physical activity. The more I explored the differences between varsity and club athletes, the more it became clear just how similar some are. Between nationally recognized clubs such as co-educational fencing, and clubs that have made the jump to being recognized as a varsity sport, like women’s rugby, clubs can go just as hard as their varsity counterparts. However, the majority of club sports do not. These differences are what make Dartmouth a wonderful and diverse community. Club sports are not a bush league version of varsity, but a completely different beast. The time a varsity athlete spends perfecting their kick, tackle, swing or catch is admirable. However, for some Dartmouth students who are not so inclined, club sports can offer the flexibility of a leisure activity rather than an obligation. Regardless of the time spent on the field, court, or yes even boxing bags, passion for sports runs through the veins of a majority of Dartmouth students.